The Polishin' Pal Clay Disc transforms your Polishin' Pal from a hand polishing tool to a clay applicator! The small disc sticks to the bottom of the Polishin' Pal to create a suitable surface to hold the detailing clay. The Clay Disc has a slightly sticky side to securely hold the detailing clay while you work. The Polishin' Pal Clay Disc is an easier, neater way to clay! The Polishin' Pal Clay Disc enables you to clay without getting clay residue or lubricant on your hands. One side of the disc has hook & loop fasteners to attach to the Polishin' Pal. 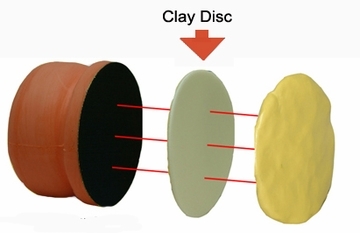 The other side of the disc is smooth and slightly sticky in order to hold the clay. The Polishin' Pal Clay Disc will enable you to clay more efficiently without getting your hands dirty! 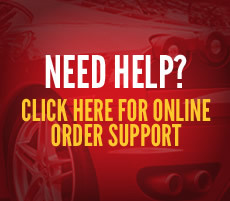 Get a handle on detailing clay! Aside from being neater than old-fashioned claying, the Polishin' Pal Disc allows you to use a larger surface of the clay. The average 2 oz. clay bar is approximately 3" x 1.5". 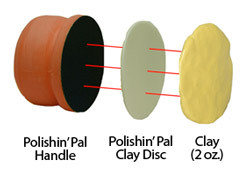 If you use it in block form, you're only using 4.5" of surface area.The Polishin' Pal Clay Disc is 3.5" in diameter. By spreading 2 oz. of clay over the entire disc and holding it by the Polishin' Pal, you're using 9.61" of total surface area. Not to bore you with the math, but using the Polishin' Pal Clay Disc doubles the amount of clay that is in contact with your vehicle at one time. Not to mention, the ergonomic polyurethane handle is easier to grasp than a slippery piece of clay. You'll cover more paint in less time and it's pretty unlikely that you'll drop the clay. Stick the clay disc to the Polishin' Pal using the hook & loop side of the disc. Flatten approximately 2 oz. of clay into a round patty and press it on the disc. 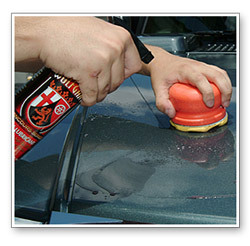 Spray a 2 square foot area of your vehicle with clay lubricant. Holding onto the handle, glide the clay back and forth across the wet area. You may feel the clay grab at first. Keep rubbing until it glides smoothly. At this point, the paint is clean. Wipe off any clay residue and continue to the next section. The Polishin' Pal attaches to the clay disc. Then flatten 2 oz. of clay to the disc. It's that easy!